Head coach Mike Bloomgren is in the early stages of turning Rice football into conference championship contender and he’s leaning on his most experienced players to help him get there. There’s something to be said for guys that really have been there and done that. 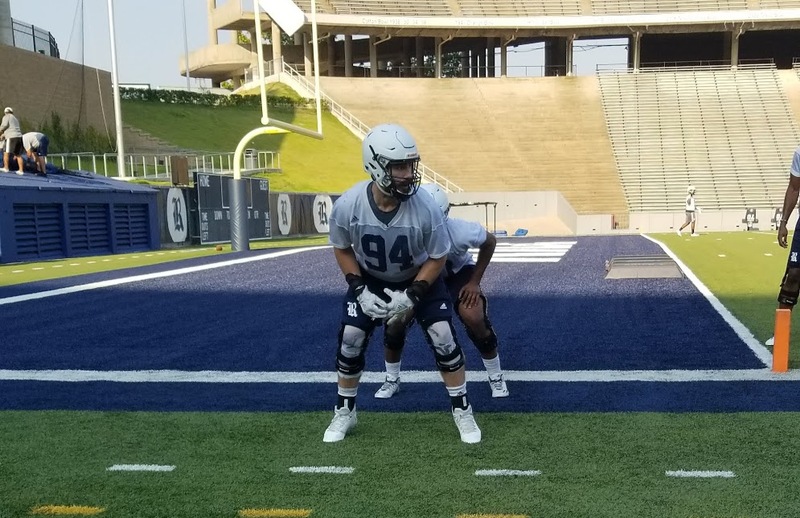 As the 2018 Rice football team embarks on their journey upward from a 1-11 season a year ago they will lean heavily on their veterans. That experienced hand will come from several sources but the net effect, hopefully, will serve as a catalyst toward what Mike Bloomgren is building at Rice. Bloomgren knows there is wisdom in his locker room that can speak to the rest of the team in ways that he can’t. A head coach can dictate, but it takes ownership to build a culture. Ultimately, creating a culture of love, physicality and competition remains at the heart of what he has set out to do. To that end, he’s assembled a 13-player leadership council to help him turn that vision into reality. That council and veteran players beyond it are crucial in laying the groundwork for Bloomgren’s program. The most senior of those veterans is 23-yeard old Graysen Schantz who started playing football at Rice when the current freshmen class was still in middle school. Four times the victim of season-ending injuries, Schantz was granted a medical redshirt and one more season of college football this fall. These freshmen are all talented athletes, making Schantz’s primary focus the film room. For many of them, this will be the first time breaking down film in a meaningful way and they’ll be learning a new system while they do it. Schantz has been doing that for five years and he’s learned a thing or two along the way. “I’ve learned three defenses while I’ve been here. It’s the same process. It’s buying into the system. It’s absorbing as much knowledge as you can, taking notes, paying attention and giving your best effort on the field, but then also correcting it in the film room,” remarked Schantz when asked about what he plans to pass on to the next wave of Rice football players. His experience will prove invaluable to this team, but he’s not alone. Grad transfer Gio Gentosi has been on campus for a little over a month after spending the most of his college career at UCLA. He’s learning the ins and outs of Bloomgren’s program along with everyone else, but there are several aspects of the college game that he feels he can help the younger players with. Gentossi called the college game “a different animal than high school football” adding “the knowledge they have to have goes a lot deeper.” For him, the knowledge came as a reserve offensive lineman and fullback under Jim Mora Jr. with the Bruins. He’s seen an uptick in his usage during fall practices with Owls and his can-do attitude has been evident. He’s lined up in the backfield, he’s been split out wide and he’s turned heads on special teams. Wherever the coaches decide to put him, he’s willing to put in the work. That’s high praise coming from a player that could be the most dominant players on the Owls’ roster this fall. Abercrumbia has been almost unblockable in fall camp, wreaking havoc on every combination of players along the offensive line. It’s evident he’s put in the work and understand the many changes that need to be made. It’s going to take more than one offseason to get the team ready to take the next step and contend for conference championships. But that hasn’t dissuaded those on their way out from putting their all into final seasons. The impact of this coaching staff cannot be undersold. From new strength and conditioning coach Hans Straub to the energy and detail being provided by the position coaches, every facet of the new program has been tailormade to produce results. Bloomgren is taking the model that worked at Stanford and bringing it to Rice. The players believe in what he’s doing and are committed to making it happen. Regardless of who gets formally recognized or how much extra work it takes, the Owls can count on their experienced members to lead the chrage. “[Leadership] comes with a lot of responsibility,” said Pierce, “but somebody has to do it… We’re all helping each other out as we go.” That help is paying big dividends in camp. This team will be ready for the fall, thanks in large part to its eldest members.